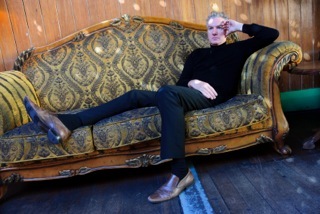 Six weeks after leaving our former abode in Sussex for a new and enriched life in Glasgow, our live music scene baptism of fire could not have gone any better than spending the evening in the company of the former Bad Seed and adroit Australian polymath Mick Harvey. Crossing over the threshold of the sacrosanct housed Òran Mór theatre, music venue, restaurant and stained glass illuminated whiskey bar complex for the very first, sealed the deal: the vestiges of the former iconic church a highly apt auditorium for the choir boy who’s music is often poetically imbued with a sense of the divine; especially his more recent FOUR (Acts Of Love) songbook of wanton forlorn and paeans to romance, which often looked beyond both Earthy and ethereal realms for inspiration and answers. A sizeable slice of tonight’s set would revolve around the beatific and attentive FOUR, but first, we’d all bare witness to a striking solo performance by fellow Melbourne compatriot, Suzi Stapleton. With a touch of the young confident and swaggering Chrisse Hynde about her, Suzi withered, stomped and sassed her way through an impressive set of Australian delta landscapes – as envisioned by Faulkner and Nick Cave – and metaphorical and allegorical flooded scenes of bloodletting, or cleansing – especially of one’s sins. With her disheveled Boho chic look and devil-may-care attitude, Suzi’s vocal style is both gruelling, raging from confessional shouting to gentle caress, and pained guttural workout. Not only does she flex that Gothic country deep voice, which often plunges so deep as to hit the bottom of a hellish abyss, but takes it out on her guitar and box of tricks, hammering away as though an outside force has possessed it. An impassioned, if at times heavy, introduction for many of us, Suzi proves a shrewd, complimentary and congruous support to tonight’s star billing – especially the reminiscent echoes of PJ Harvey, who of course Mick has produced on numerous occasions and much of his backing band have played with. In an affable mood, amongst old friends it seems, an acoustic guitar strapped Mick took to the stage with his musical sparring partner and foil J.P. Shilo and drummer – flown in from Geneva that morning – Jean-Marc Butty. Similar to Nick Cave’s relationship with Warren Ellis, J.P. flits between lead guitar, violin and discordant maelstroms of anger, pain and epiphany whilst also lending backing vocals. Paying reverence to and marching to the drum of Lee Hazelwood, Mick begins with a ceremonial cover staple of ‘First Street Blues’, before turning in a sullen, but heartfelt, eulogy to the ill-fated and late Australian music legend Rowland S Howard, ‘October Boy’ – I say sullen, more of a serious mood (though J.P.’s heavy Orson Welles brow and brooding Errol Flynn resemblance cast a thoughtfully sad shadow, the multi-instrumentalist is in fact enjoying himself thoroughly throughout), one befitting a sad tribute but also a warning to the rock’n’roll myth. In a knock-about manner, Mick’s banter and bemoaning criticism of his equipment – a few minor teething problems, but nothing to cause any concern, or impact on the energetic performance – break-up the succession of songs from his last few albums. However, it would be Mick’s first solo LP of wholly original-penned songs, Sketches From The Book Of The Dead from 2011 that would dominant proceedings. Rousing versions of ‘The Ballad Of Joy Givens’, ‘Two Paintings’, ‘The Bells Never Rang’ and ‘Frankie T & Frankie C’ were reeled off in sagacious fashion. From his 2007 album Two Of Diamonds, we were treated to a storming, more aggressive and pumped-up version of ‘Slow-Motion-Movie-Star’, a bitter sweet, brooding ‘photograph’ and a Passenger style Iggy strutting ‘Out Of Time Man’. Going back even further to 2005’s One Man’s Treasures, his first proper solo outing, we’re treated to a more jaunty and humorous take on ‘Hank Williams Said It Better’. But personally speaking, it is his 2013 LP FOUR that really shines and sounds so wondrous tonight. We often go on about this, but we were the only blog as far as I know to feature it in the best albums of the year on its release, and to even praise it. Possibly the most romantic and poetically descriptive of all his works so far, the album channeled hallowed wantonness and worshipped at the suns benevolence. The opening paean to the elements and love itself, ‘Praise The Earth’ has never sounded so venerable, live and played with certain vigour by the band tonight. And ‘I Wish That I Were Stone’, as close to pop as Mick himself confesses, benefits by a bouncer, slightly faster timing – sounding indeed like a classic pop hit. 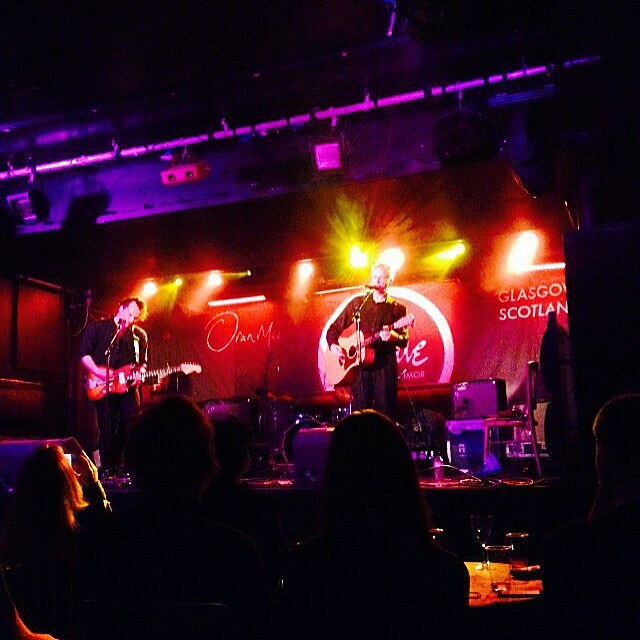 Both songs remain two of our favourites in recent years, and to see them finally played live, lifted from their more subdued, but still bright and enthralling recordings, is a joy. Chaos reigns on the cover ‘Summertime In New York’; J.P. working overtime, wrenching a squealing rabid noise from the lead guitar, drowning out poor Mick at one point, who jokingly berates his foil for his excessive indulgence at the end. Finishing with aplomb, brought back for a pared down, at first, encore (after a lot of messing about to get the right effect working on Mick’s guitar first), the trio performed Serge Gainsbourg’s ‘Bonnie & Clyde’. Lifted from Mick’s homages to the French genius and lothario, the coquettish duet, normally performed with his wife, is a solo effort this evening – his partner otherwise unwell and unable to make it. A teasing gesture really, as Mick is alternating solo shows with an extended cast and strings adorned sets of concerts of his 90s tributes to Serge, Intoxicated Man and Pink Elephants. He did suggest that he might bring the show to town at some point, which I’m hoping is a serious consideration. But then he also quipped that he might bring it to T In The Park, before suggesting that Scotland’s biggest – and for the most part commercially dull – festival was rubbish, wasn’t it? Looking to us for confirmation with a mischievous wink, he couldn’t remember if The Bad Seeds had even played it, which of course they had in 2009. Despite the intimate setting, Mick’s pan European and modern Australian folkloric song collection is played with a real ferocity and energy. Breathing life back into his oeuvre, Mick proves that his durable songwriting talents should get more of an airing. And lets hope he sticks to his words and follows up by bringing the Serge showcase to Glasgow soon. 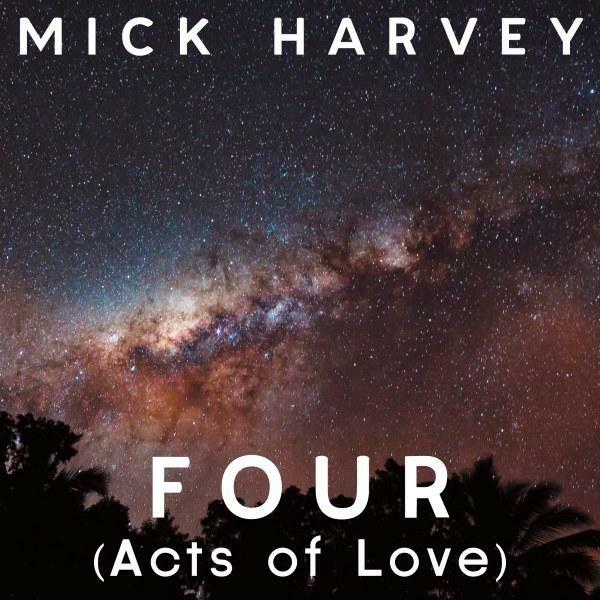 Wearily beaten by the afflatus ‘hammer’ from above, Mick Harvey waltzes through an attentive cycle of concatenate forlorn and romantic paean on his latest LP, FOUR (Acts Of Love). Imbued with, a seriously, impressive CV (Antipodean’s principle hardliners of elegant morose,The Birthday Party, Nick Cave & The Bad Seeds, and PJ Harvey’s collaborative producer on her successful Let England Shake) Harvey follows up the 2011 Sketches From The Book Of The Dead with a loosely threaded ‘three act’ concept. Whistling vignettes (Midnight On The Ramparts), Wim Wenders’ pining desert song (Fairy Dust and the cover of PJ Harvey’s Glorious), and throughout, eye towards a prevailing hallowed presence, the endearing luxuriated Harvey burr and lyrical delivery remark on loves awkward synchronicity and heartache. Channeling the pensive balladry of The Walker Brothers and rich sound of Grant Lee Buffalo, he pays tributary to a diverse cast of influences: covering songs by, fellow Australians,The Saints (the Stephen Trask redolent The Story Of Love), Van Morrison (an esoteric organ pitched The Way Young Lovers Do), Exuma (meandering jazz version of Summertime In New York) and the ‘other’ synonymous man in black, Roy Orbison (wistfully sad take on his Wild Hearts). Divided into sweeping ‘universal contemplation’ sonnets and brief stirring segue ways, the album’s perfect running order is set out like a wanton play on vulnerability from an antagonist, worn down but not yet taken over by cynicism.